Lately, CBD has gained a lot of attention and experienced a surge in popularity across the world. With its ability to provide relief to everything from pain to depression and anxiety, it is no wonder why so many are drawn towards this amazing natural product. But what exactly is it, how do you use it and what are the benefits of using it? In this guide, we will demystify this and other relevant questions. 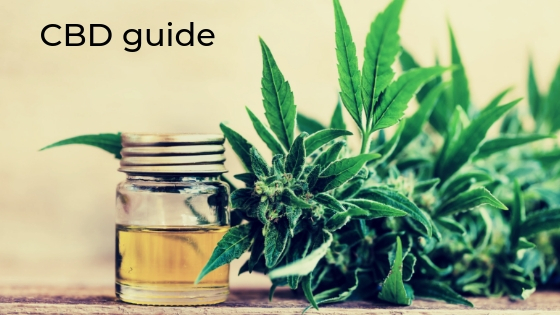 Whether you are completely new to CBD or you already have experience using it, this guide should provide you with all the knowledge you need about this magical gift from nature. Cannabidiol, commonly called CBD is a naturally occurring compound found in the cannabis sativa plant. Cannabis sativa contains over 100 of these natural compounds called cannabinoids. Tetrahydrocannabinol (THC) is another popular cannabinoid found in cannabis and known for its psychoactive properties. CBD and THC have the same molecular structure and contain 2 oxygen atoms, 30 hydrogen atoms, and 21 carbon atoms. The atoms are arranged differently, and this has a huge impact on the effect of these cannabinoids. The THC (tetrahydrocannabinol) is better known for its recreational and psychoactive components than for its health benefits. It gives the “high or stoned” feeling when used; CBD is non-psychoactive and will not make a person feel “high.” Multiple studies suggest it to offer a range of potential positive health and medicinal benefits, which explains the engine behind its growing popularity. According to the World Health Organization (WHO), CBD does not have the potential to be an addictive substance – in other words, it is completely safe to use. CBD is extracted from the industrial hemp plant. It is present in the resins of the plant. The quality of the CBD oil is determined by the resin. The resin is a thick substance found in the glandular trichomes in the flower of the plant. Smaller amounts of resins can also be found in the leaves and stem of the plant, but the highest concentration of cannabinoids can be found in the resins of the plant. After harvesting it goes through an extraction process to capture the active compounds. This extraction process can be done in several ways. The most common ways are CO2 extraction and alcohol extraction. If you want to purchase CBD oil, look out for descriptions like “full spectrum”, “whole plant extract” or “full plant extract.” This way you are sure the CBD oil also contain a variety of the other cannabinoids present in the plant. The endocannabinoid system and how it works. CBD connects to our body through tiny receptors located throughout our nervous and immune systems. This system is known as our endocannabinoid system (ECS). The ECS is a biological system composed by a collection of cell receptors which helps to regulate sleep, pressure, reproduction, pain, memory, and many more. Our ECS plays a very important role in stabilizing our bodies and bringing it (back) into balance. This process is known as homeostasis. Has your heart beat rate increased? Do you need to rest? Is your temperature too high? Are your hormone levels what they should be? When something in your body is happening outside the right range, your body activates the ECS to correct or balance it. This is done through the cannabinoid receptors found in selective tissues. These receptors include the cannabinoid receptor 1 (CB1) and the cannabinoid receptor 2 (CB2). The CB1 is found within the central nervous system (the brain and nerves of the spinal cord) and the CB2 is found in the peripheral nervous system (the digestive system and some specialized cells in the immune system). CBD works uniquely throughout the ECS as it agitates or interacts with the receptors found on the ECS. CBD is susceptible to hovering or agitating the receptors. How to use it? Types of available products. CBD products can be taken in various ways. Here are the most typical ways. Oil drops: This is probably the most popular way of taking CBD. Thanks to the ease of use and versatility. Place your dose under the tongue for at least 60 seconds before swallowing. This is a very efficient way of getting your CBD. Vaping: Inhaling CBD oil is the fastest way to feel the effect. This is done by vaping CBD e-liquid from a vaporizer in the same way as using an e-cigarette. The CBD is immediately absorbed into the bloodstream through the lungs. Capsules: Orally ingesting gels, capsules or edibles is another popular way to dose CBD. These pills typically contain a higher concentration of CBD(like 15 to 25mg), The benefit is that you easily can measure the amount of CBD you get each time. Be aware it will take a longer time for the effect to kick in and some of the active ingredients will be wasted in the process since it has to pass the liver this way. Skin Care (topical): These are CBD infused lotions, balms, and oils that are absorbed through the skin for the localized relief of joint pain, muscle soreness and inflammation. The human skin cells are loaded with receptors, which means you can treat directly where you have an issue. The potency of CBD is unquestionable, while researchers continue to investigate the extent of health benefits that CBD offers to humans and animal alike, full discovery is yet to be achieved. Pain relief: CBD interacts with receptors in your brain and immune system to create anti-inflammatory and painkilling effects that help with pain management. Research has found CBD oil to be beneficial for people with chronic pain, such as chronic back pain, arthritis, and other pain-inducing ailments. CBD acts by attaching itself to the CB2 receptor that manages pain and inflammation in your immune system. Anxiety: Generalized anxiety disorder, panic disorders, obsessive-compulsive disorder (OCD), and social anxiety disorder are some of the anxiety related disorders that CBD relieves. CBD activates the cannabinoids in your brain to give you a renewed sense of confidence and poise. Insomnia: Because CBD reduces constant anxiety, a dose of CBD at night allows for a sound, restful night of undisturbed sleep. Often referred to it as a lullaby charm, CBD helps to induce peaceful and relaxing sleep with no side effects the morning after. With CBD, you wake calm, fit and ready to take on your day. Stress: CBD helps reduce stress and improve mood by gently and naturally calming your overactive mind. When taking CBD oil, you’ll feel more peaceful, relaxed, and in control. Cardiovascular health: Several studies examining potential effects of CBD on heart disease have shown impressive results. The antioxidant, anti-inflammatory, and pain relieving properties of CBD have been noted to ease the pains of cardiovascular diseases and improve cardiovascular health. Furthermore, CBD could help to reduce pressure and quell inflammation in the heart. Improves Skin Condition: CBD oil offers a unique blend of skin improving essential nutrients, including vitamins, minerals, proteins, and fatty acids. It stimulates the growth of healthy glowing skin, helps to shed off dead skin and prevents wrinkles. CBD is rich in antioxidants that protect your skin from damage from the sun and free radicals. It also supports skin cell growth and inhibits oil production to help keep your skin soft and supple. Alzheimer: Over the years, several newspapers and blogs have reported that cannabis or one of its components can help in treating Alzheimer’s disease. Studies have shown that the use of CBD oil has been effective in slowing the progression of the disease. PTSD: The treatment of PTSD with the use of CBD oil has been one of the most successful benefits of this oil. Much of its promise originates from its analgesic and anxiolytic properties, including its ability to boost the brain’s serotonin receptors and increase feelings of relaxation. Depression: Depression is a medical illness that impacts how you think, feel and act. It prevents you from enjoying activities you once loved. Regular use of CBD provides relief from this condition. Epilepsy: After a comprehensive research on the benefits of CBD oil for treating epilepsy, the use of Epidiolex has been approved for therapy for Lennox-gastaut syndrome and dravet syndrome. These two rare conditions are characterized by epileptic seizures and are difficult to manage with other types of medications. Schizophrenia: Some of the symptoms of psychosis include hallucinations, disorganized speech, and delusions. These symptoms characterized psychosis and CBD has an antipsychotic effect. It effectively reduces psychotic symptoms and gives the individual an opportunity at being normal again. Cancer: Some studies have researched the ways CBD affects cancer, though still in its early stages. Studies show that CBD slows the growth or can cause the death of certain types of cancer cells. However, it is strongly advised that you seek treatment and do not depend only on CBD if you have cancer. In recent times, the demand for CBD had skyrocketed as a result of its ability to treat several ailments. Many are yet to enjoy the benefits of this plant because of the fear of whether it is legal or not. Since CBD can derive from the same plant as THC, which still maintains an illegal status in most European countries, there is a lot of confusion surrounded with its legality. However, rest assured that CBD is legal across the whole Europe and most of the world, provided it has been derived from an industrial hemp strain and containing a maximum of 0.2%THC. This is because hemp derived CBD has no psychoactive effects. Sales, purchases or the possession of CBD across Europe are completely legal. Each country has laws guiding the use of CBD and it is best you familiarize yourself with the laws in your country before using it. We do encourage everyone purchasing CBD to check up on the local legislation. Be aware of varying legislation in case you are traveling to another country and wish to bring your supplements. The better you are informed, the easier it is to purchase the right product. CBD comes in different shapes, qualities and sizes. To choose the right product, consider factors as full spectrum CBD oil, extraction methods, the taste, how soon the effect takes place, price, concentration and ease of use. This helps you streamline the products that will work for your circumstance and those that won’t. After this, do a research on companies that sell high-quality products. Do they have manufacturing certificates, do they have the products they sell tested by 3rd party laboratories, can you reach their customer service? These are questions that need to be answered before you eventually buy from a company. We are living in exciting times and we at Canaroza are convinced this is just the beginning of exploring the endless possibilities of the positive impact CBD and the cannabis plant can have for the health of humans and animals. Governmental bodies are finally approving certain cannabinoids and outdated laws surrounding cannabis are rapidly being changed. Researchers now have the opportunity to investigate the complex compounds of cannabis and this will help us further understand this magical plant in a more scientific manner. CBD has changed the way people view hemp. It is no longer a question of if it works or not – it is now how to use it and to benefit from its therapeutic effects.